Last week, Jerry Jerry and I were talking about recruiting and propaganda. This, in essence, is what he said. The Average Recruiter is like a bore at a party. He talks you listen. Average recruiters tell their candidates "This job is great and you're gonna love it." The candidate is a passive recipient of information. A Top Recruiter, however, is like a Svengali. She gets her candidates to buy-in. "Where's the kool-aid? This job is great and I'm gonna love it!" an impartial presentation of information. No. Propaganda presents information in order to influence opinions and behavior. Recruiters don't do that, do they? No, never! Film: Jerry at work.. Exact Quotation: Animal - you've unwittingly stumbled upon a key difference between average/lame recruiters and those at the top. Average recruiters tell their candidate the job is great and they're gonna love it. Top recruiters help their candidates say "The job is great and I'm gonna love it!" Normally that kind of info would be available only to those sitting in a seminar or buying the training material. But here on RBC it's FREE!!!!!! Maureen, yours is an interesting comparison but it is, alas, anachronistic. Rasputin became famous during the era of the Russian Revolution (1917). 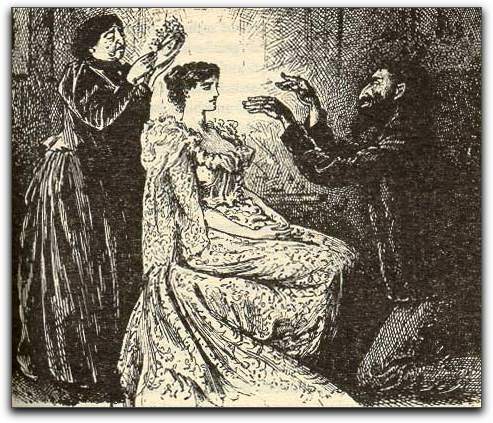 Svengali was a character in Trilby, a novel written by George Du Maurier who died in 1896. It was published in 1894. Also, Rasputin was a salacious, Russian Orthodox monk. Svengali, although from Poland which was then part of Russia, was a musician of a somewhat different persuasion. Uhhhh I missed that one entirely! I believe Jerry's quote belies why he is one of the top recruiters. He gets 4) and 5) without compromising his legitimate use of 1), 2), and 3). Ami, R U accusing Jerry Jerry of deception? A word on deception: if anyone believes their role (in recruiting) is to deceive and trick people into taking the wrong job they are going to be overworked and underpaid. What I meant in the quote above is very simple. In being the recruiter going about telling candidates what a "great" opportunity you have you spend your time being the one talking. When you change your goal from telling the world about your job and inviting THEM to TELL YOU what they think of the opportunity you will (at some point based on skill, ability to referral and then engage) HEAR someone tell you why it is the right position for them. It's really the only approach that makes sense. For me there is no confusion. Seduction? Maybe. Isn't any step forward in one's career seductive? A promotion has great appeal in my book. Propaganda? I'll agree here. Our job in sales is to present info at the right time and place as to achieve the greatest impact on the sales process. I could go on for a few hours (or days) about how and when to close (ie: present a selling point) but we'll save that for another day. Deception? No need for lies if you choose your clients and candidates wisely. I could go on for a few hours (or days) about how and when to close (ie: present a selling point) but we'll save that for another day. Sorry, Jerry, that's not quite true. Whenever you actually get a chance to go on all day, you clam up! I'm not accusing Jerry of anything, I'm complimenting him. We seem to have a knee jerk reaction to the idea of deception because it implies "I'm being victimized!" It's a me-centric response which excludes the possibilities of understanding the virtue of deception -- given a noble intent. Example: Camouflage is a tool of deception. Is it right or wrong? Your nailed duplicitous. It's not the same as deception. I'm half Irish and half Clam. What do you expect from me? Hi Ami. Thanks for the compliment - but I can't accept it. Deception is not part of my tool box - noble intent or not. I'm not quite sure how the idea got started but it's incorrect. Jerry Jerry said:: I'm half Irish and half Clam. What do you expect from me? There you go, putting down of the Clams again. Can't you be a little more diverse? Ami Ami said: that deception can be good -- given a noble intent. Okay, but lets get some better examples. Camo is used in war to benefit the de-ceiver at the expense of the per-ceiver. Showing my lack of vocabulary here, but I'm with you Jerry. Tricking someone, or misleading someone into a job never works out (not that I have seen anyway) from an inhouse perspective, people leave, and you lose credibility, TPR, people leave and you have a replacement or guarantee to honour. But yeah, present your case in the best possible light by all means it's your job!